I miss the East Coast Malay food *drools as I reminisce* ... nasi dagang...nasi kerabu...ayam percik...keropok lekor....all the kuih-muih...murtabak...omg, someone swoosh me back to the East Coast now! Ah...in the end, I was 45% satisfied...yeah, a 'lil below average cos of the not-so-nice ayam percik. I want the Kuantan version!!! 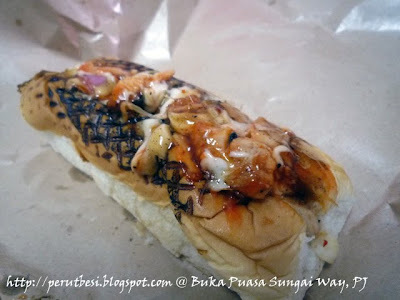 Pieces of chicken kebab (a type of barbecued chicken) stuffed into a "fire-toasted" hotdog bun & drenched with mayonnaise, chilli sauce, & chopped onions. Erm...I didn't find this very yummy & it's over-priced as well!! 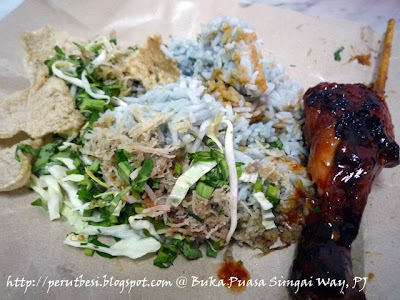 It's even more expensive compared to my nasi kerabu =.="
Ya lah still got no chance to visit this ramadan bazaar. hopefully do it b 4 raya. like you said hanya setahun sekali....I love Malaysia..